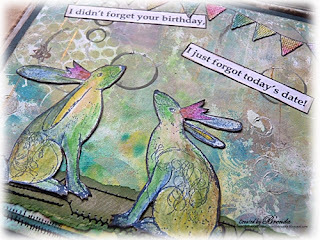 I told you last Thursday I was desperate to play with the new CI stamps and gelli plate prints and here is my first sample combining them both. Jean has already published it on the Crafty Individuals blog. The background started off as a 'ghost' print from the gelli plate, that is a second pull from the plate, much lighter in colour and often with bits missing. But it wasn't quite enough so I started to spray with Dylusions but they are much too strong, I thought I had ruined it but managed to save it by spraying with water so the colour could bleed and I blotted some of it out too. This meant my paper was soaked, but that's ok, I just used a heat gun and an iron with greaseproof paper to dry it out and keep it flat. It then had much more depth to it as the acrylic paint acts as a mask and the colour of the sprays only come through the gaps. To create more dimension I stamped some circles over the top and used a credit card to get some straight lines too. The photo above shows a sample of the print straight from the gelli plate and how it looks on the card once I had spent time adding to it. 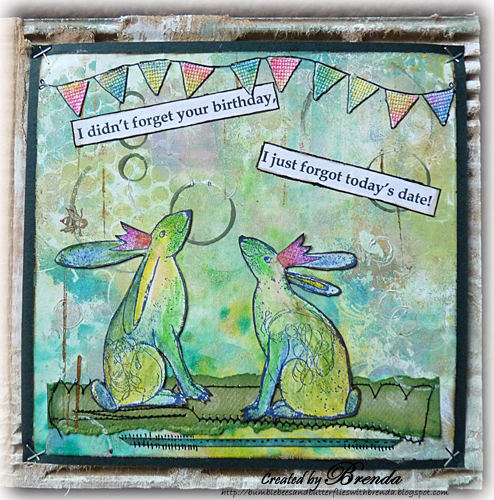 The bunnies were stamped with cobalt archival ink, coloured with Aquatone sticks and blended with water. The bunting was cut from canvas sheet, coloured with Caran D'Ache crayons and blended with water. The card itself is made from corrugated cardboard and painted round the edges. Another one coming soon and I have just finished my PanPastel DT piece for Sunday which includes another of these fabulous stamps. Everything is back to normal now, I have just got to clear a few more bits of Christmas wrapping etc from the spare bedroom and tidy up and the house is totally sorted for the new year. Well done on getting to play with your new gelli plate and images and great job resurrecting what you thought MIGHT have been a disaaster (dahling!) and ending up with a pretty fab card in to the bargain! This is beautiful Brenda, I love it. All I need to do now is find out more about gelli plates. Fantastic Brenda love this beautiful creation. Marvelous colors too. This is a great finished piece Brenda and a fantastic job.Great colours too. Fabulous card and background. I got these stamps as a gift cannot wait to use them. So beautiful... the delicate background is just gorgeous - getting more and more fascinated by these gelli plates I'm hearing about everywhere (though I still don't really know how they work - time for some research)... And the new CI stamps look just wonderful against it. Happy New Year, Brenda - hope 2013 brings you and your family all you hope for! Love the soft blended colors of the bunnies...gorgeous! Happy New Year to you! fabulous card and the background is gorgeous! What a lovely creation, dear Brenda! Love the colours, the background and the bunnies. Wishing you a healthy, happy, and joyous New Year! I look forward to more of your beautiful creations in 2013! Oh I am really loving what you do with those plates! Love the pastel colors and of course those adorable little bunnies! Lucy and I were chatting about Tim's new CHA items, have you had a look? Hugs! your bunnies are gorgeous and I love your saying with it, too funny! So wonderful. I really love the images and the colors. Beautifully done, Brenda - love these colors! Thanks for sharing it with us at the Simon Says Stamp challenge! This is really beautiful Brenda! 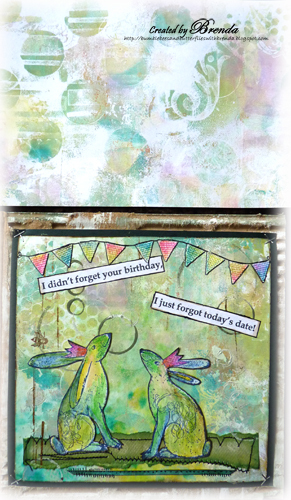 I love what you've done with your gelli plate and the later additions add so much. Not my usual style of stamps but how lovely are these?! I've converted totally! Happy New Year to you and your family. I had a long break so I'm just madly catching up with everyone. Beautiful birthday card, fab background using the Gelli plate! Thanks for playing along with the Bloggers Challenge! Gorgeous card Brenda! I need to play more with my gelli plate! oh yes! I love this!!!! remins me on a little booklet I bought for my daughter as she was a baby! Wonderful!